Over the next few weeks, we'll be profiling all the contributors to The Shadow Booth. We're really proud of the writers we have lined up - hopefully you'll see why! First up is Paul Tremblay. Paul is the author of Disappearance at Devil’s Rock, the Bram Stoker Award winning A Head Full of Ghosts, The Little Sleep, and the forthcoming The Cabin at the End of the World. He is currently a member of the board of directors of the Shirley Jackson Awards, and his essays and short fiction have appeared in the Los Angeles Times and numerous “year’s best” anthologies. He has a master’s degree in mathematics and lives near Boston with his wife and two children. 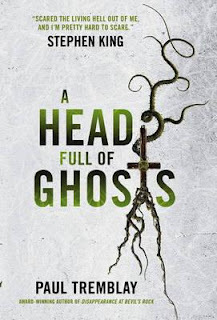 A Head Full of Ghosts won the 2015 Bram Stoker Award and the 2015 Massachusetts Book Award for Best Novel. It was included on several “Best of” lists for 2015, including: NPR, the AV Club, LitReactor, Tor.com, and was selected as one of the Washington Post’s Best SF/F novels for June 2015. It was a Finalist for the GoodReads Choice Award for Best Horror, a Library Journal Summer Reads pick, and was an independent and chain bookseller favorite. Read an interview with him on the Wall Street Journal website, here. And remember to order your copy of The Shadow Booth now! Find us on Kickstarter here.